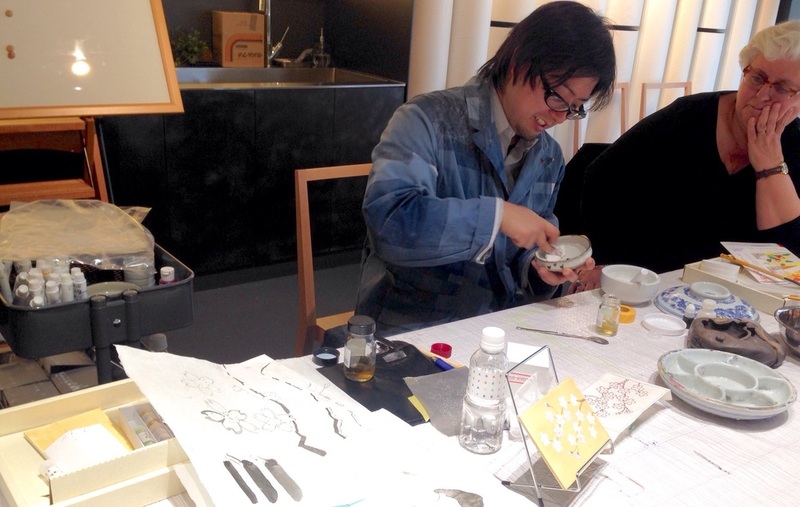 I was so excited about my very first workshop on Traditional Japanese Painting with Terada Art at Tennozu Isle, off Shinagawa. So despite the late post, I thought I would love to share my experience with everyone. So what exactly is traditional Japanese painting? Well, the main focus is most probably on pigments. I was introduced to different pigments and how they came from grinding minerals and rocks. Mixing these powdered pigments with animal fat brings a shade of Colour for painting. I was told that in the past, people do use animal fats from rabbits to even crocodiles. Different animal fats give rise to different textures and that's another big chapter that Sensei didn't go further due to time. Here's how my beginner set looks like. Powdered minerals, a bottle of liquified animal fat, ink, brush and the painting card. First, tape your draft outlines and carbon paper firmly to the painting board for tracing. Diluting black ink to 3 different shades. And we draw over the carbon lines as official outlines. Then comes the painful and tricky part. Mixing and rubbing animal fat and oyster powder to a certain consistency as a base coat to make sure pigments stay. Oyster shells were used and grinded till fine powder. Sensei told us an example of how these shells were used in making Traditional Hina Japanese Dolls. As the Oyster shells had different tones on white and off-white, the off-white brownish part of the shell would be used as basecoats as they are sturdier than the white parts. Hence, the bottom coat will be the brown part, leaving the white parts for the topcoat. Japanese Hina Dolls - Photo credits to Japan Today. Sensei went on and told us how smart the people of the past were by using every single animal part they could get their hands on. Taking for example a rabbit, the meat would be eaten, fur for keeping warm or for brushes, and fat for cooking or as a solvent for pigments. Rubbing them together bit by bit with the ball of your 3rd finger. Then, mixing pigment mineral powder with the animal fat, rubbing them to your desired consistency for painting. And here's the almost completed piece of Sakuras for spring! I learnt so much on pigments, culture and techniques of a painting style I have never been in touch with. After the workshop, I felt for artists who invented art in the early times with raw ingredients that they have and can afford. Not to mention the spirit they had. (All that curiosity and patience!) We often take art materials for granted, but this session made me take a step back to appreciate what we have and how they came about and be thankful.